How to buy a theme on PremiumCoding.com site? 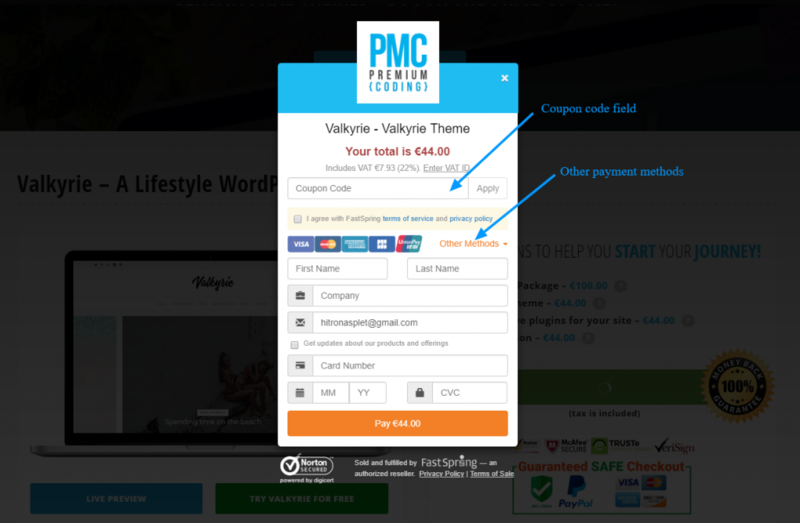 Purchasing a theme on PremiumCoding.com site is very simple. There are only two steps to complete and after that, you can download the theme and build your Beautiful WordPress Blog. Go to a theme that you like, for our example, we will select Valkyrie theme. You can always buy only the theme, but you can always choose extra options and features for a faster and easier start. You will get the theme, plugins, demo content and all necessary documentation and instructions. Service is valid for one website. A project starts once the client provides complete details, not a time of actual purchase. Installation of the template is not included in this service. If you don’t want to spend your time installing the template, don’t hesitate to order expert assistance. The installation will be completed within 24 hours by our Service Center once the access details to your hosting server have been received. Service is valid for one website. Project starts once the client provides complete details acceptable by production to avoid delays, not a time of actual purchase. Let’s talk about one other feature that can help you decide if the theme is right for your needs. As you can see in the image you can try the theme before you make the purchase. This is a really simple process, just click on the button which will lead you to the form, where you can enter your email and in a minute or two you will receive login details in your email. If you like the PremiumCoding site and you wish to receive latest WordPress related news, information about new WordPress Themes and Our Themes updates, you can subscribe to our newsletter. Now that you have decided which theme is right for you, click buy now button. For security purposes, we use FastSpring as our payment provider, which is a USA based company with very strict security standards. After you click the button the popup window will appear. In the first window, you just need to enter your email address. 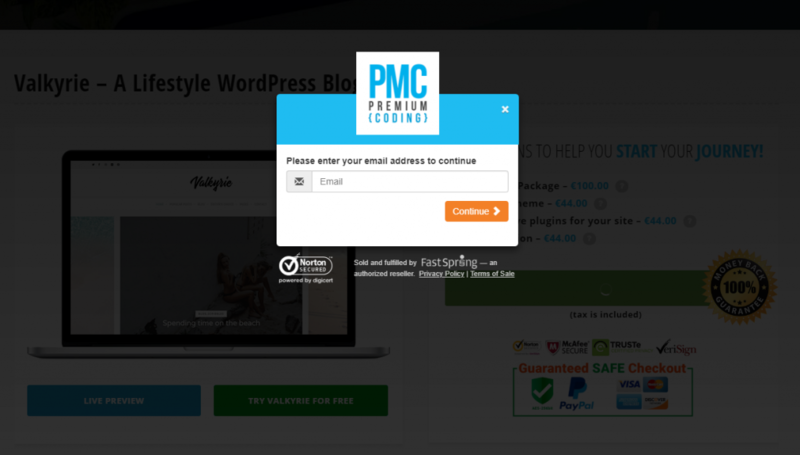 In the end, just click Pay button and you will become a proud owner of a new beautiful WordPress theme. After a successful payment, you will be redirected to payment confirmation. Now click continue button and you will be redirected to your account. If you don’t receive the login details please check your SPAM folder. If your SPAM folder is also empty please contact us via the contact form.